An iPhone is supposed to be a personal device, as there are very rare cases when more than one person will use it on a regular basis. The same can be said for iPod touch and the iPad. Usually they fall under the category of devices which a person can customize for their own use, without having to think about what will be convenient for another person if they decide to use the device. It is also a known fact that all handheld, or mobile in other term, iDevices run on iOS, which is Apple’s operating system customized for such gadgets. All iOS devices have a few common features, which can be found throughout the OS, whether it is on the smaller screen of the iPhone and iPod touch, or the much larger one of the iPad. One such feature, or app, which is universal through iOS is, its web browser. Unlike Android, which uses a lot of different web browsers on many mobile devices, iOS devices predominantly use Safari. It is the same with Mac, where Safari is the favored browser for Mac OS X. While Safari has many virtues, like its speed and efficiency, this lightweight browser can certainly use a few improvements. 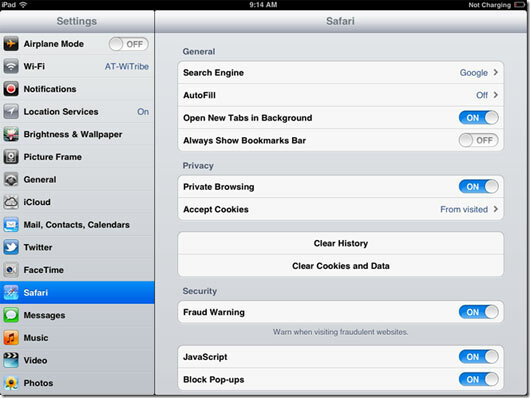 What if you want to use Safari for some private time? You might want that for a variety of reasons. You might want to view some content which you don’t want anyone else to know about, also it is possible that if you browse the web the normal way, your important password and other personal information might be compromised. One simple solution is to wipe your browser history every time you access some such data, but that can prove to be unnecessarily cumbersome, and you might forget doing it just one time, rendering all your hitherto efforts futile. In many desktop browsers there is the private or incognito mode for such occasions, and once you enter such a mode in your browser, it will stop tracking you completely and neither your history, nor any cookies or form data will be stored by the browser. On the surface you won’t find such a mode in iOS Safari, but look closely, and turns out it is possible to use Safari on iPhone like a detective. Here is what you need to do. First of all, go to the Settings app in your iPhone, iPad or iPod touch. In it you will find that there is a separate menu of Safari, enter it. Once inside, the next step you have to go through is to locate the submenu named Privacy. Tap on it and the menu will lead you to its internal controls. Here, switch on private browsing, and then for good measure turn off cookies as well so that your trail will be completely covered. Now each time you use Safari on your iOS device, it will not keep your history or any other telltale data which might later get you in trouble.